This Friday marks the 65th anniversary of one of the greatest moments in British history. With some justification, it has been called ‘our second Finest Hour’. But as the welfare state and the National Health Service reach retirement age are both of them being pensioned off by a government intent on austerity and endless rounds of welfare and public sector ‘reform’? Monday, July 5, 1948 was known as The Appointed Day. 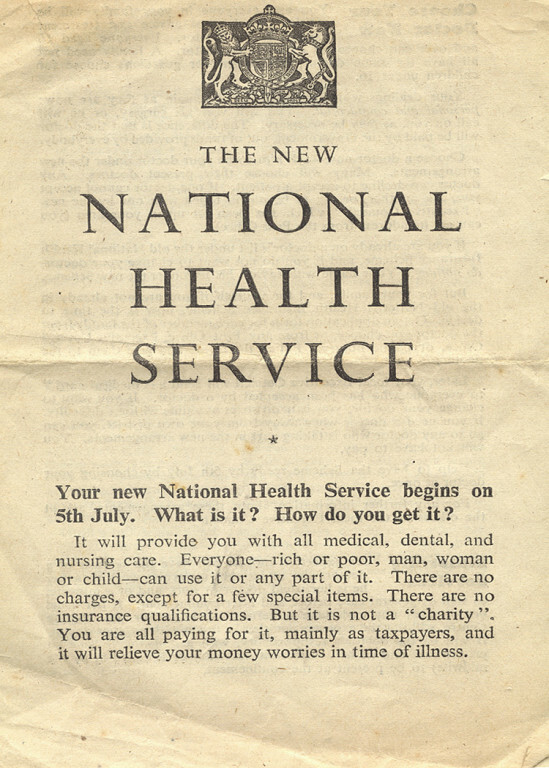 It marked not just the start of the NHS but also full implementation of the Beveridge plan for social security. A comprehensive system of national insurance now complemented earlier measures including family allowances and industrial injuries compensation. Tales abound of women with prolapsed uteruses and men with massive hernias held in by trusses arriving in doctors’ surgeries able to be treated at last. Some people were able to get their first pair of spectacles after years of relying on looking through the bottom of a jar. In Birmingham, health centre staff arrived for work early and barricaded themselves in their offices terrified that there would be a stampede for free treatment. Instead, when they looked outside at 9.00, there was an orderly queue of mothers and babies. In Edlington, South Yorkshire, the brass band from the local colliery marched to the doctor’s surgery and began to play. The GP hung a Union Jack in the window and gave them all a drink. The NHS replaced a patchwork of voluntary, municipal and private provision (though private healthcare of course continued alongside it). Employed people had national health insurance and access to ‘panel’ doctors but non-working women and children, the self-employed, high earners and many elderly people were not covered. Affluent areas teemed with doctors while deprived ones went short. Class discrimination was rife, with some GPs admitting their private patients at home and their panel patients in lock-up surgeries. To give some idea of the costs, a woman earning £1 a week with a husband earning £3 a week was paying a fee of one guinea each time they went to the doctor. When her son was born two years before the creation of the NHS, the bill for the nursing home was £22 and the ambulance to get there cost £1 5s. The new system was far from perfect. The nationalisation of hospitals implemented by Aneurin Bevan was generally seen as the only way to make sense of the new system but it was bureaucratic and was soon costing more than predicted. Bevan was forced to buy off opposition from doctors by ‘stuffing their mouths with gold’, allowing consultants to maintain lucrative private practice and pay beds in NHS hospitals and GPs to remain self-employed rather than salaried. Only half of dentists signed up. However, it was an astonishing success and remains our most popular institution. It is also indelibly associated with the Labour Party. The Conservatives would also have introduced an NHS with free treatment but, as Nicholas Timmins argues in The Five Giants, they failed to come up with a workable method of integrating more than 3,000 municipal and voluntary hospitals into a national service. They also voted against the Bill twice, leading to an enduring impression that they cannot be trusted with the NHS. Flash forward 65 years and things look very different. Some of this is due to the imperfections in the original system. Escalating costs mean that medical treatment in Britain is no longer entirely free: Bevan resigned from the Labour government when prescription charges were introduced for NHS dentistry and spectacles to save money in 1951; seeing a dentist now costs serious money even if you can find an NHS dentist; and hidden charges on things like hospital car parking escalate year on year. Away from the NHS, the social security system as implemented never really met Beveridge’s social insurance principles (as I pointed out in my blog on the 70th anniversary of the Beveridge report). Social and economic change meant that means-tested national assistance became a key part of the system rather than an emergency safety net and new groups needed help that had not been envisaged in 1948. Over the years, and especially since 1988 (when the welfare state hit 40), governments from both parties have introduced a series of market-oriented reforms. In health, a purchaser/provider split and an internal market with price competition under the Conservatives between 1991 and 1997, was followed by the replacement of competition with cooperation and performance targets under Labour between 1997 and 2006 and then the re-introduction of the internal market but with volume rather than price competition between 2006 and 2010. That process has accelerated dramatically under the coalition with the Health and Social Care Act 2012. Critics argue that it makes further privatisation of the NHS in England inevitable as private companies step in to run GP commissioning groups and regulations force commissioners to open up their services to competition from ‘any qualified provider’. Supporters accuse the critics of hysterical reaction and scaremongering and say the changes merely follow the logic of previous reforms. Time will tell on that but, as private involvement in the NHS grows by the day, can it really be safe in the hands of a minister who once hid behind a tree to avoid reporters when he had dinner with James Murdoch while he was culture secretary? Am I the only one who detects a smug smile of satisfaction behind the mask of concern on the face of Jeremy Hunt as he reacts to the Care and Quality Commission scandal? Elsewhere the welfare state is under more pressure than at any time in its history. For some, breaches in the principle of universality mean it is time to write the obituary. According to Aditya Chakrabortty of The Guardian, ‘it expired, peacefully in its sleep, on January 7’ 2013 when means testing was introduced for child benefit. There is something in that argument but it ignores the fact that we already had means testing in many parts of the system and still have universality in others (not least the NHS and – so far at least – the basic state pension). However, there are two other trends that lead in a similar direction. First, the introduction of private competition and the profit motive into all parts of the welfare state relies on an assumption that it does not matter who provides services so long as they remain free at the point of use. But what if things like health had to be taken out of private ownership for a reason? What if economists are wrong to put so much faith in the market? What if the result of even quasi-market reforms is to so hollow out the public sector that after a while there is no alternative? And what if (in the term used by Bruno Frey and Michael Sandel) market values so ‘crowd out’ altruism and ethics of professionalism and public service that there is no alternative to them either? Second, public opinion appears to be growing increasingly hostile to the whole idea of ‘welfare’. The political rhetoric of ‘strivers’ and ‘hardworking families’ seems to be one of the Conservatives’ strongest weapons, leaving Labour fearful of being seen to be on the side of the ‘scroungers’ and ‘shirkers’. In times of austerity, benefit after benefit is being pared to the bone in what was already one of the less generous welfare systems in Europe. As the regime of sanctions and tests develops, the presumption seems to have shifted from one where claims are seen as genuine unless proven otherwise. In the area I know best, housing, there have always been gaps in the system for home owners and more recently for young renters. However, as the bedroom tax, benefit cap and bedroom caps bite, there is no longer any pretence that housing benefit will cover the full cost of rent and recent reforms will accelerate the slow death of social rented housing. This is part of a trend that will only get worse, as 1 per cent benefit uprating and the welfare cap announced in the spending round last week ensure that benefits fall further and further behind the rate of inflation. As Julia Unwin of the Joseph Rowntree Foundation has argued, for the first time since Beveridge we are facing a ‘decade of destitution’. If two of the original five giants, Disease and Ignorance, still smack of the 1930s, Idleness has returned with a vengeance, and is now blamed on the individual rather than the state of the economy, and Want and Squalor are here once again too. The welfare state may not be quite ready for its gold watch just yet (after all, the pension age will soon rise to 66 and then in stages to 70 and beyond). Provision for the elderly is also the least affected part of the system – or at least it is so far. However, on 5 July, 2013, and with each day that passes, we are drifting further and further away from Bevan’s vision of the ‘security’ and ‘serenity’ that would exist ‘in place of fear’. Sources for this blog include Peter Hennessy’s Never Again: Britain 1945-51, Ken Loach’s film Spirit of 45 and, once again, Nicholas Timmins’s magnificent The Five Giants: A Biography of the Welfare State.